Raised Garden Beds Work Great! 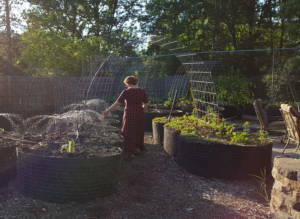 Both ergonomic and economic, raised beds encourage bountiful harvests year after year. Raised Garden Beds are a wonderful gardening tool. 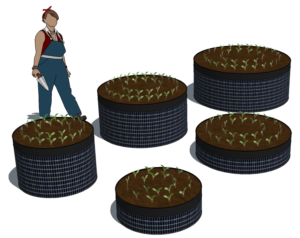 Less stressful on your back and knees, it is easier to garden in a raised bed than in-ground, ground-level beds. 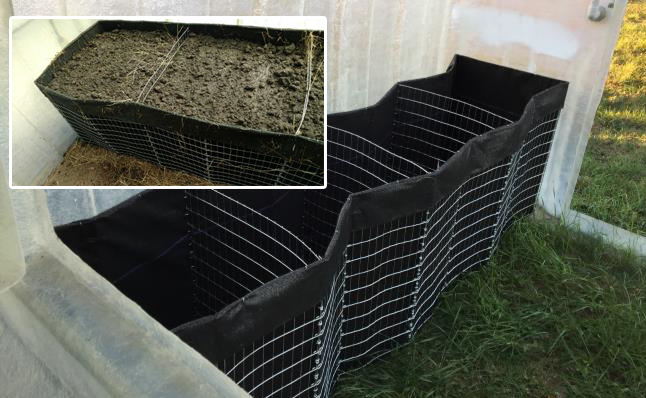 You can customize the soil mixture in a raised bed to meet your individual need. Perhaps you need a higher pH or more of a particular element for a favorite crop. 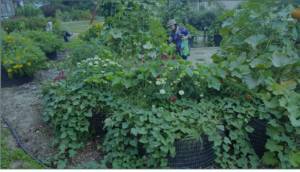 You can amend the soil as necessary in as many or as few raised beds as you need. Using a raised bed in a greenhouse has additional benefits. 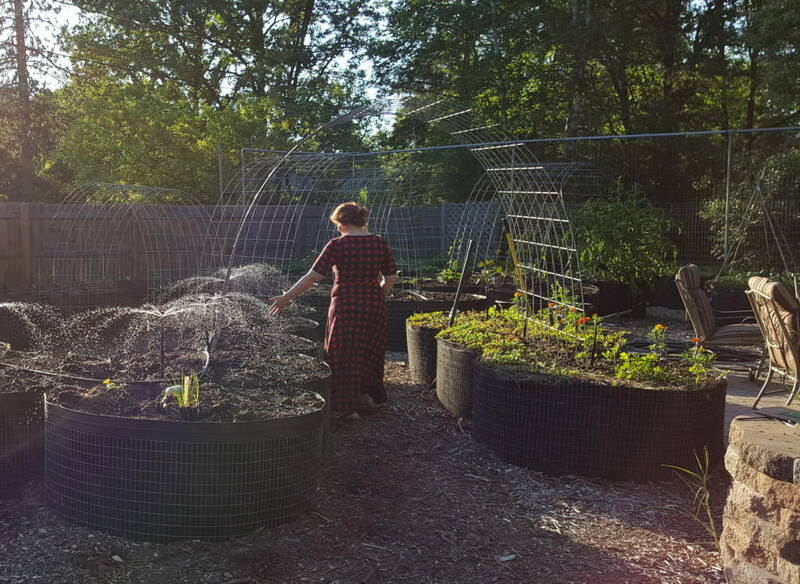 Because the raised bed fabric is dark, it is going to absorb and retain the heat that builds up in the greenhouse. 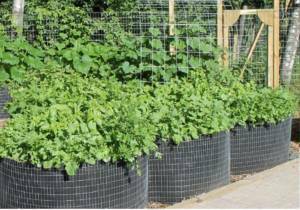 This is especially beneficial in the spring when you want to encourage seed germination and growth in beds that are warm. As the temperatures cool in the evening, the heat that has been stored in the bed will be released into the interior space. This concept is known as a heat-sink. It also works well in the autumn when you want to maintain late season harvest. 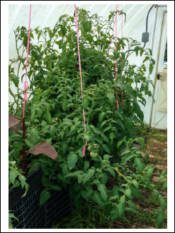 By the end of the summer, the heat-sink engine is fully energized and will continue to supply heat during the cool nights to finish ripening tomatoes and peppers. One tomato plant gone wild! Recommended for the Gardener and Homesteader models. Wide enough to accommodate a row cover for additional versatility. Recommended for the Hobby model. 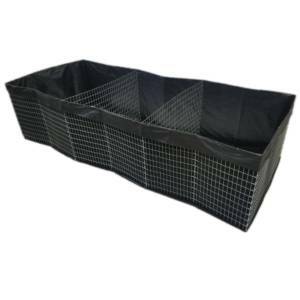 Narrow enough to allow for ample spacing for a potting bench or containers. Price includes shipping to your home in the contiguous US. 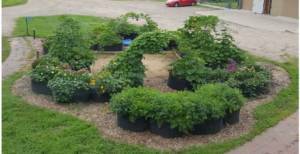 Also available are round raised beds in 3, 4 and 5 foot circles. 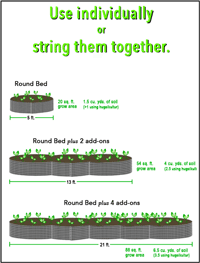 Extension beds allow you to make any design configuration. The round beds come in 2 different heights: 2 foot (24 inches) and 1 foot (12 inches). Only the 2 foot tall beds have the extensions available. You can add on any round bed extension to expand your garden and shape it into almost any design you can think of. For creative purposes, you can attach a 3-foot add-on to a 5-foot round bed. 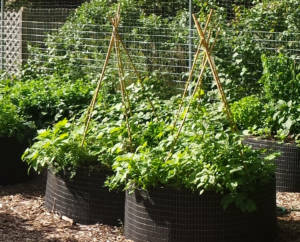 Our Raised Garden Beds were specifically designed for use in our greenhouses by Garden Circle Designs®, maker of creative, affordable raised bed garden systems. Their proven construction design is an excellent asset to our greenhouse accessory products. They have allowed us to not only offer the Raised Beds designed for us, but their entire line of Garden Circle Raised Beds. What materials are used to construct the Raised Beds? Our raised garden beds are made from galvanized steel mesh and geo-fabric. They are lightweight, durable, and lasting 10+ years. Set-up takes just minutes with no tools needed. 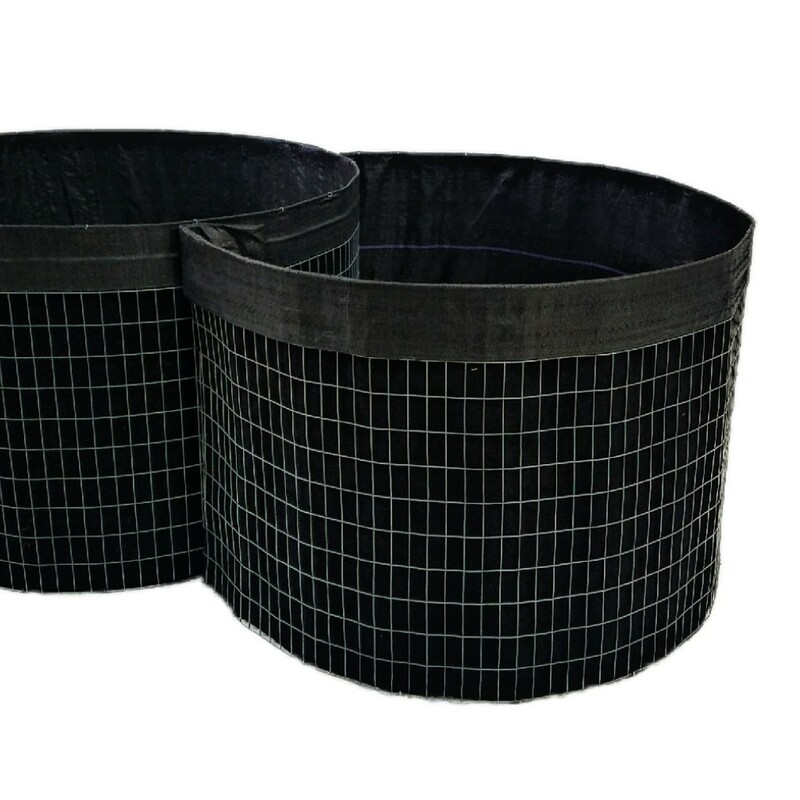 Standard models use a black geo-fabric and a premium option is available with white geo-fabric. How do I get one or more? We have tried to make it as easy as possible. 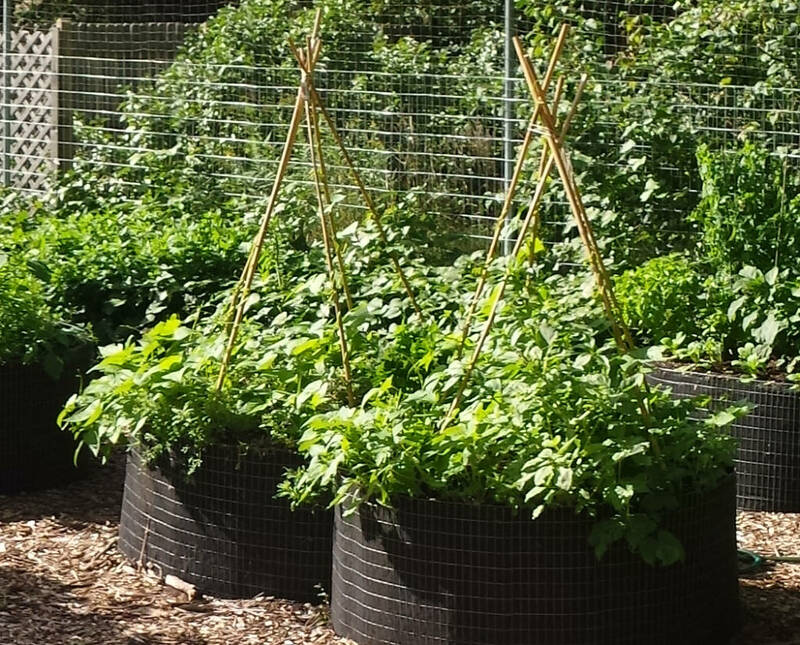 Whether you want a raised bed for your greenhouse or a Garden Circle for your yard or garden, you can order them from MI Greenhouse and it will be drop shipped to your home for a one, easy to calculate price. Click here: contact@migreenhouse.com to send us an email with your email address, shipping address and your order and an invoice will be emailed to you. The invoice an be paid by credit card, bank transfer or by personal check. Just let us know when you get the invoice. Simple as that! It’s easy peasy! 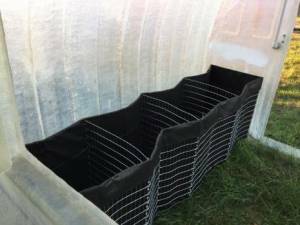 The rectangular raised beds come flat, wrapped with a nylon strap. Simply cut the strap with scissors or a knife and unfold like an accordion. Set it up with the loose flap end on the bottom. We suggest filling it with decomposable material like leaves, clean biodegradable materials like grass clippings (those not treated with an herbicide), vegetable scraps, or animal bedding. These materials will really settle in the bed so it is okay to fill almost full. We suggest soaking it down to help it settle and adding 3-4 inches of new bagged soil. You can use garden soil but understand that you may be introducing some unwanted organisms along with it. I like to throw in worms as I find them in my gardening endeavors.